Q. So what are the decisions that are being called-in? There are two decisions that have been called in. The first is Cabinet’s decision of the 16th January to consult on closure of Lyndale School. The second is is a decision made at the same Cabinet meeting to change how much schools are paid for people with high needs. Q. So if the decision called in was taken in mid-January why hasn’t the call in been decided yet? Well the reasons are a little complicated. When the new constitution was approved last year, instead of all call ins going to the whichever scrutiny committee was relevant to the call in, the system was changed so that all call ins go to the Coordinating Committee. However there was a legal requirement on Wirral Council when considering educational matters to have extra voting representatives on the committee making the decision (between two and five parent governor representatives and one representing each of the diocesan bodies). The Coordinating Committee didn’t have such representation and due to the way the constitution is written, only Council can co opt people onto committees, so the meeting got adjourned to the 27th February so that the Council meeting on the 25th February could co-opt the relevant people. Q. What exactly is a call in? If six (or more) councillors disagree with a decision, they can request another committee look at it to see if it needs to be changed. Once a decision is called in, nothing further is done about it until the call in committee have reached a decision. That committee can then either uphold the original decision or make a recommendation back to the original decision making body that a different decision is reached. Q. So what are the reasons why consulting on closing Lyndale School was called in? The category of Complex Learning Difficulties (CLD) includes children with Profound and Multiple Learning Difficulties (PMLD) and children on the Autistic Spectrum. Their needs are different. This is not made clear. The School has been in discussion with the LA about its future for 8 years. The uncertainty has caused some parents to send their children elsewhere. The educational needs of the children are not analysed. In paragraph 2.8, the LA admits they have failed to consider the funding of the school over past years. The funding arrangements are, in reality, in the hands of the LA and, in fact, were agreed at the same time as this proposal. The argument about overheads ignores the present discussions between the LA and Governors about reducing overheads. Table 2 does not discuss the different nature of the intakes of the 3 schools. This is misleading. The work done by Eric Craven on behalf of the LA looking at the needs of the PMLD pupils at the Lyndale and other schools has never been referred to. The resolution of the Council of February 14 2010 and the work done by the LA following this have not been referred to, not even mentioned. This should have formed the context for the present decision. So what does that all mean in plain English? There are kids who are autistic at the schools that the children from Lyndale School would be moved to if it was closed. The kind of support each group of kids need is different. As parents know Wirral Council have been threatening to close Lyndale School for a number of years, they have chosen to send their children elsewhere as they wouldn’t want their education disrupted if the school closed. I think Cllr Harney is referring to the report being mainly about money. When closure proposals are considered, whoever is making the decision (in this case the Cabinet) has to (its a legal requirement) take notice of guidance issued by the government on making such decisions. Part of this guidance is something referred to as the “SEN Improvement Test”. Put in a nutshell the SEN Improvement Test means if a special school is closed then those children who are affected by its closure and transferred to other schools have to receive an education at those new schools that is equivalent to or better than the education they got at their previous school. The parents of children at Lyndale School disagree that this would be the case. Each year Wirral Council receives a ring fenced grant for education from the government. For 2014/15 Wirral Council will receive just over £240 million. It’s down to the politicians to agree a policy as how this money is divided up each year. Cllr Harney is also referring to the other policy decision that was called in which determines how much money special schools receive for people who have high needs. Overheads refers to the fixed costs of running the school. Table 2 refers to the average cost per a pupil at five schools (Elleray Park, Foxfield, Lyndale, Meadowside and Stanley). Each special school has a different sets of pupils with different needs, therefore different staffing requirements (and overheads). Comparisons on a raw cost of cost per pupil therefore don’t take into account that each child is different, the cost of supporting each child will be different and also that at Lyndale School there are a number of children with medical needs that leads to increased costs. I’m sure Cllr Harney will explain what this refers to on the 27th February. This review came back to Cabinet in January 2012. It had eleven recommendations, all eleven were agreed by the Cabinet. Q. So what are the reasons why the decision on how money is allocated to special schools called in? The banding proposals (para 2.7) are not based on a clear costing of the needs of the children. In particular, the needs of the children with profound and multiple learning difficulties should be quantified. There is a clear need for one to one in terms of adult presence for many of the children. There is also a need for teaching and other staff. These are in addition to the running costs of the school. In the case of the Lyndale, the funding proposals will result in the closure of the school. This has not been made clear in the paper. So (again) what does that all mean in plain English? The report and its appendices on banding proposals can be read on Wirral Council’s website. Each child would be placed into one of five bands. Each special school would get £10,000 + an amount depending on which band the child was in. These extra amounts range from band one (approximately an extra £1,000) to band five (an extra £16,000+). The band for the children with the highest needs assumes a staff ratio of 1:6 plus two teaching assistants, plus medical support. Lyndale School has children that would be placed in the new bands three to five (£17,000 to £26,000+ per pupil). Some of the children at Lyndale School require a staffing ratio of one to one. Even if these children were in band five (the highest band), the money that Lyndale school received under the new policy wouldn’t Lyndale School’s costs. Although there is flexibility in band five, Lyndale School’s average cost per pupil in 2012-13 was £33,105. If the banding proposals were adopted it would lead to a shortfall in Lyndale School’s budget of £72,000, getting worse in future years which would lead to the school closing. So what about the minimum funding guarantee that means that Wirral Council can’t reduce the funding to schools by more than 1.5% compared to last year? Wirral Council have applied to the Education Funding Agency for an exemption from the minimum funding guarantee which would guarantee schools receive at least 98.5% of what they received last year. The outcome of Wirral Council’s application is at the time of writing unknown. What about the special schools contingency of £908,900? Some of the contingency could be used to fund Lyndale School’s deficit in 2014-15. However, Lyndale School’s deficit is predicted to be larger in 2015-16 than in 2014-15. If the banding policy is agreed, it’ll lead to the closure of Lyndale School at some point in the future. What about the SEN (Special Educational Needs) underspend in 2013-14 of £500,000? Some of the SEN (Special Educational Needs) underspend could be used to fund Lyndale School’s deficit in 2014-15. However, an underspend in the SEN budget can’t be guaranteed for next year and a more long-term solution is needed. What about the petition against closure of Lyndale School? The petition (at the time of writing) is of 6,407 signatures against closure of Lyndale School. Who will decide the call ins? There are fifteen councillors on the Coordinating Committee who are Cllr Steve Foulkes (Chair (Labour)), Cllr John Salter (Labour), Cllr Jean Stapleton (Labour), Cllr Moira McLaughlin (Labour), Cllr Denise Realey (Labour), Cllr Pat Glasman (Labour), Cllr Paul Doughty (Labour), Cllr Bernie Mooney (Labour), Cllr Denise Roberts (Labour), Cllr Alan Brighouse (Liberal Democrat), Cllr Leah Fraser (Conservative), Cllr Adam Sykes (Conservative), Cllr David Elderton (Conservative), Cllr Wendy Clements (Conservative) and Cllr Andrew Hodson (Conservative). Their contact details can be found on Wirral Council’s website. In addition to these fifteen, there are a further three with voting rights who are Mrs H Shoebridge (parent governor representative), Mrs Nicola Smith (parent governor representative) and Damien Cunningham (representing the Roman Catholic Diocese of Shrewsbury). At the time of writing the Diocese of Chester (Church of England) haven’t made a nomination to the committee. If the Labour councillors (9) voted to uphold the Labour Cabinet’s decisions and the other councillors (6), parent governor representatives (2) and Damien Cunningham voted against it would be a tied 9:9 vote. If that was the case the Chair Cllr Steve Foulkes would have a casting vote. Are there any more points? Closing down a school they may have been at for years and moving them elsewhere to a different place, with different staff and different pupils would be very difficult and traumatic for them (and their parents) to cope with. If the school closed and the children would lose staff that had spent many years learning what their needs were. Some of the parents have said if the school is closed they will home school their children instead. 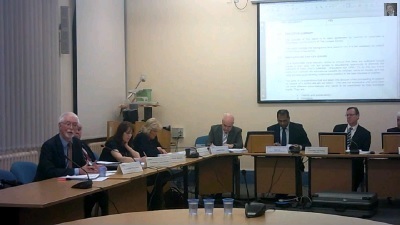 « Will contingency in Labour’s 2014/15 Schools Budget be enough to fund outcome of Lyndale School call in?